heehee--- I like the scale comparaison! I thought the items in the pic from yesterday were MUCH bigger! You got my green thumb to itching!! I love rosemary! Where are you located fellow Mo. girl? I'm in West Plains. Ooooohhhhh! I can't wait to start planning out my garden (moving into a new home, that alread has 2 raised beds)! Now the urge is unbearable!!! I can't wait to plant! I have herbs coming up and now we are suppose to get 4 inches of snow tomorrow! those pots are great too - McCoy? But I did go and answer all your questions this morning. Only problem is, the comments are not posting. This is not usually the case and is confusing to say the least! You should be able to find my response to your questions by clicking here. Well, I've just realized that the reply I left to all the comments here is not showing up either. GRRRRR Blogger! I did answer you all. It's somewhere. And Lindy, I received your rosemary comment via email but it isn't here either. 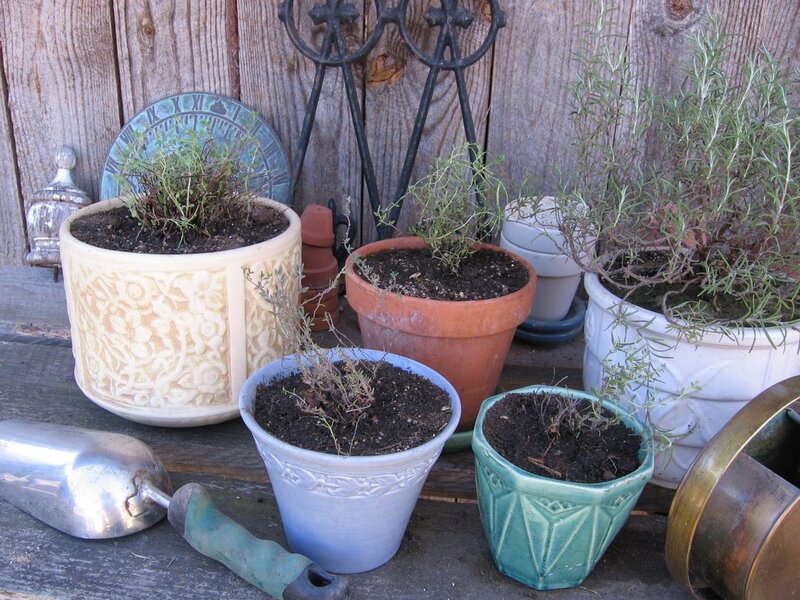 What do you do to get your rosemary through the winter? I have not had much luck in the past, indoors or out, and envy the way folks in mild climes have huge rosemary plants in their gardens.But your clime is not mild! Thus far, my porch plant from the summer died at work-though parked on the wonder windowsill where my meyer lemon tree is in its 2nd winter, and 3rd group of lemons.I thought it would be perfect, as they turn off the building heat at night, and there's a ton of light. I think the windowcleaners may have sprayed it with something nasty. My little standard rosemary tree is living on thus far, on a regimen of mostly sheltered but sunny outdoors,on my porch and moving inside for really cold nights. I'm afraid a sudden frost will take it, though. I usually overwinter the majority of my potted herbs in the unheated greenhouse, but this year I ended up bringing 17 pots of herbs in the house, including two rosemary plants. They are cozied up next to the woodstove in front of a window that gets indirect light and seem to be doing fairly well, especially since I just transplanted most of them into larger accommodations. I have dreams of a "real" herb garden (and even have one of my 4'x8' raised beds set aside for it), but I'm afraid to put most of my herbs in the ground because I don't think they would survive the winter. I do have chives and lemon balm planted in the ground. In general, I much prefer to grow everything in the ground rather than in pots. It's much less work, of course, but more importantly, in my experience the plants are just much happier and healthier in the ground. Here's a copy of the comment I left earlier. Hopefully it will show up this time. As you can see, I replied to a comment Mireille left which isn't even showing up here. Thank you. These scraggly plants should look much better in a few weeks once they've settled into the nice composty soil I transplanted them into. You're right. I went back and looked, and they do seem much bigger if you don't know what size they really are. Neat. Thanks for pointing that out to me. That's the kind of thing that makes sharing photos so much fun for me. There's nothing better than starting a brand new garden. And how wonderful that it already has two raised beds. They are definitely the way to go, in my opinion. Congratulations and good luck! The weather has been so weird here this winter. We did have one morning that was -3F, but now it feels like spring and people have daffodils coming up already. I figure we're either going to just slide right into spring or we're going to get pummelled with a humongous ice and snow storm sometime this month or next. It'll be interesting to see what happens because this kind of long warm spell confuses all the plants. I just love colorful pots and have been collecting them for years. I think all of the ones in this photo are unmarked, but I know I do have a few McCoy floating around, as well as some Bauer (my favorite!). I think that big off white pot on the left is unmarked Roseville, but I can't remember for sure. Oh, you make me feel guilty. I've got so many plants in containers from when I was renting. I'm afraid to put some of them in the ground in case we have a bad freeze and it kills them, but they can't stay in containers forever. Sigh. I could put my rosemary and lavendar in the ground, though. And maybe I will. Heh. She says.